There are definitely a lot of memorable moments but the most memorable one was making the wrong turn at Wilson County Championships in the last 50m of the race that almost cost me the W.
Kazelee Johnson was my biggest competition over the past four years. There was never a race where he would not pass in the last 50m over a race. This kid has a kick! Shoutout for his 3rd place finish at the 2A State Championship! Dipping under 17 for the first time and catching the dub in a very tactical race against New Balance National Freshmen Qualifier, Kamare Watson. Also, keep an eye on this freshman who has dipped under 4:40 for the full mile! I would train not necessarily harder but smarter over the summer, focusing more on tempo runs and finishing with a stronger kick. Running alone at practice. I was the top runner since my junior year and it did become a little difficult trying to hang on those long runs alone. The unexplainable feeling of a PR. Stay determined and motivated, do not let one bad race define you. Learn about the sport, it is not an easy one anyone can master. What you put in at practice will pay off; however, the small details of staying hydrated, maintaining a well-balanced diet and having enough sleep is what will separate you from the rest. My coach viewed me as a leader and I have had a large amount of respect for his point of view. 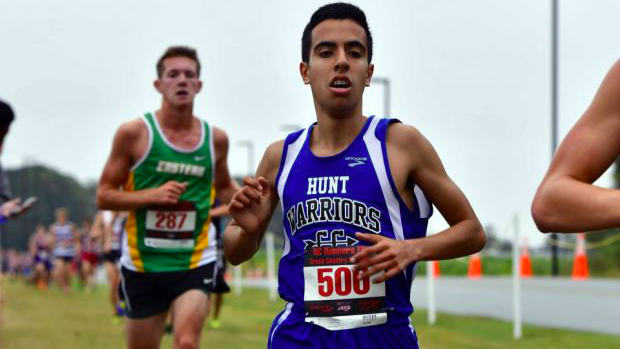 He appointed me as captain of all three running seasons at Hunt my junior and senior year, and from there my goal was to set an example for all the younger athletes who would soon fill the top spots. What are your college plans? I plan on majoring in Aerospace Engineering at NC State where I will join the club running team. Who would you like to say thank you to? Thank you to Evan Lee, Kellie Boykin, Kate Furiness, Rebekah Pierce, and Alyssa Coleman for the trips to Denny's after an exhausting day on the track. Thank you Milesplit for distracting me in class when I should have been doing my classwork.